Platoon fails to score in the opening inning; sending leadoff hitter Dom Hanna to the plate for the Legends in the bottom of the 1st. He singles to right. Two batters later, Hanna scores on an RBI double by catcher Noah Rodriguez. First baseman Jaime Martinez is hit by a pitch. He's followed by left fielder Gio Mazzola who slaps a 2-run double to right. Second baseman Pablo Garcia responds with an RBI single of his own. The Legends end up with 4 runs in the inning to take the early 4-0 lead. Platoon has its first 15 batters retired in this contest; bringing us to the bottom of the 5th inning with the score still 4-0 Legends. Noah Rodriguez leads off the inning for the Legends. He hits a bloop single to shallow right center; getting his 2nd hit of the game. Batting next is Jaime Martinez, who is still looking for his first hit of the contest. He finds it; ripping a shot well over the left field wall for a 2-run homer. Pablo Garcia, Sabino Pitones and Jake Klossner all followed with singles; but would not score. The Legends settled for 2 runs in the inning on the 2-run blast by Martinez; now leading 6-0 through 5 complete innings of play. The score would remain 6-0 Legends as we entered the bottom of the 7th inning. With 2 outs in the inning; the batter was Pablo Garcia, who already had 2 singles and an RBI on the day. He strikes again with a solo homer to left. The Legends add a run to their lead; now up 7-0 through 7 complete innings of this AAA championship. This day definitely belonged to Legends starting pitcher Eric Anderson. He stepped to the mound in the top of the 8th inning with a perfect game in tact; having retired 21 straight. He loses the perfect game as Platoon's Steve McGrath draws a leadoff walk. Two batters later, Anthony D'Angelo reached base due a fielding error. Those would be the only two to reach base for Platoon in the inning. Anderson would walk onto the mound in the top of the 9th inning; having lost the perfect game and now 3 outs away from a no-hitter. However, that too was spoiled as Platoon shortstop Eddie Knips slapped a single to left for the first (and last) Platoon hit of the championship. The next 3 batters go down in order, ending this championship contest. 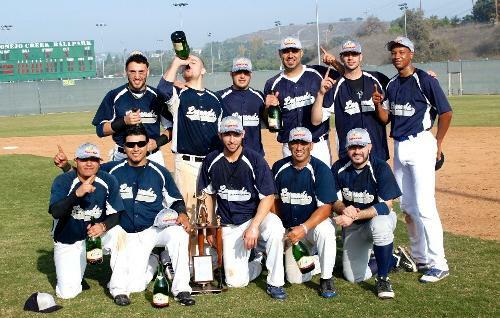 Congratulations to the 2012 AAA Division Champion Legends on a great season and their third straight PCBL championship! And to the championship MVP, Legends pitcher Eric Anderson, for such an amazing effort in this contest. He pitched a 1-hit shutout; walking 1 and striking out 13! Awesome game!